What child doesn’t love animals? Combine that with their love for music, and you’ve got a recipe for pure delight! Join us for our January playdates: A Trip to the Zoo! 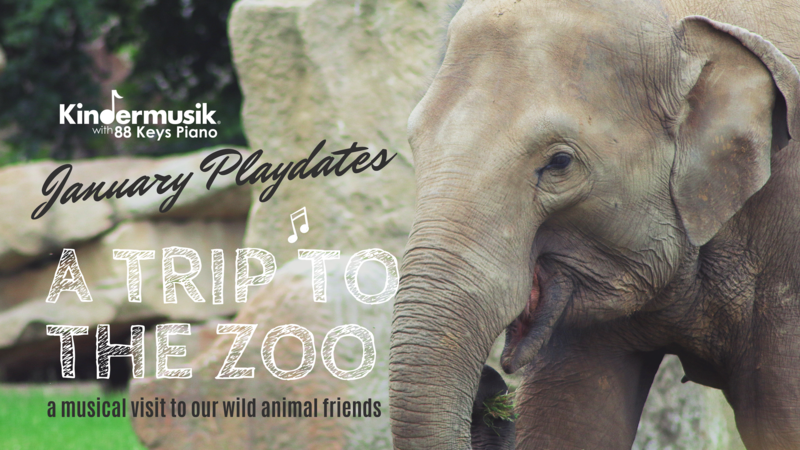 We’re off to the Kindermusik Zoo, where we’ll meet swinging monkeys, tall giraffes, playful polar bears, cuddly chicks, and many more of our little ones’ favorite animals. You and your child won’t want to miss this zany and exciting musical adventure! Our January playdates will be held three times, so feel free to enroll in one or more dates. Playdates are open to children ages 0-7 and their caregivers! Spaces in each playdate are limited and tend to fill fast, particularly the weekend dates, so hurry to enroll now and save your family’s spots! Saturday, Jan. 19, 2018 at 10am – STILL ROOM! Saturday, Jan. 26, 2018 at 10am – STILL ROOM! Wednesday, Jan. 30, 2018 at 10am – STILL ROOM!